400-200 million years ago: Erosion from the majestic (Himalaya-sized) Caledonian mountains (where the highlands are now) deposited the sand that became the stone from which the farmhouse is built (likely Upper Old Red Sandstone). 4 March 1809: The architect who was to design Comiston Farmhouse (William Notman) was born, in Kirkurd, Peeblesshire. His father is given as John Notman [www.ScotlandsPeople.gov.uk - GROS data 764/00 0020 0229], and his mother as Margaret Kemp. Sep 1810: James Forrest (future Lord Provost, and owner of "Comiston") marries Charlotte Horsburgh [City of Edinburgh Archives ACC322]. 1832-38: Gray's Annual Directory John Curror [future tenant of Comiston farm] was farming at West Pilton, Cramond. 1838-39 & 39-40: Post Office Annual Directory & Calendar Archibald Dumbreck listed as farmer at Comiston. 1841: Archibald Dumbrick/Dumbreck (aged 21) is resident at Colinton/Hailes (Census, GROS 677/00002/00003). 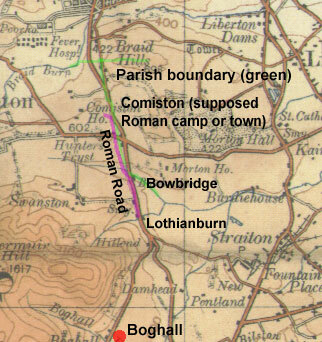 2 May 1841 (Sunday): Bell's Life & Sporting Chronicle under the heading "Pedestrianism": Running and Leaping.-- A correspondent states that on Thursday last a match came off at Comiston, about three miles from Edinburgh, when a young farmer, Mr Archibald Dumbrick, performed the task of leaping 25 hurdles four feet high 20 yards apart, in the short time of three minutes and ten seconds, and immediately afterwards running a mile in four minutes and forty seconds. Mr Dumbrick performed the two events with comparative ease, taking all his leaps beautifully, and could have accomplished the running of the mile in some seconds shorter than he had been disposed, but as the time allowed was six minutes hurrying himself was unnecessary. The betting was 2-to-1 against his performing the feat within the specified time, which a few of the knowing ones took, and a considerable sum changed hands in consequence. There was a large concourse of spectators, it being fast day in Edinburgh, and a few of Mr Dumbrick's friends afterwards dined together, and the evening was spent with the greatest of hilarity. 1838: Sir James Forrest of Comiston is conferred a Baronetcy by Queen Victoria on her coronation. John Curror contributed 5 shillings subscription towards the Fever Hospital. 30 May 1850: The TImes p.4 Issue 20502 Sir James Forrest was chairing the 11th AGM of the Life Association of Scotland [a life insurance company?]. Business was good. 1851: John Curror is resident at Colinton/Hailes (Census, GROS 677/00002/00015). 1852 November 5: William Notman (architect of farmhouse) marries Barbara Graham at Davidson's Mains in Cramond Parish. They would have four children: John, Susan, William & James. 1855: John Curror is “tenant occupier” at Comiston (Valuation Rolls VR108/1/32). John Curror was a poultry judge at an Aberdeen show... he was also on the Highland & Agricultural Society of Scotland committee (for "General Shows"). "All and whole the lands and mains of Comiston with the Mansion House or Manor place thereof houses biggings yards orchards lofts crofts outsets insets parts pendicles ... and whole pertinents thereof comprehending these forty acres of arable land ... and land commonly called the Oxgangs and Baads ... and the Short Boig ... "
14 April 1860: The Examiner (London) Issue 2724. Obituary of Sir James Forrest states that he qualified as an advocate in 1803; politically he was a Whig; became Lord Provost in 1837; raised to Baronet in 1838 by Queen Victoria. 1865: John Curror [tenant farmer] acted as a "gentleman of skill" [expert witness] in support of an Oldhamstocks farmer who'd been denied his last crop before the lease expired on his farm (there had to be a re-trial, and the case lasted years; the document is a long one!). 1865 John Curror is “tenant occupier” at Comiston (Valuation Rolls VR108/11/29 & 34). John Curror mentioned in an article about Cattle Plague, which was prevalent at the time. 26 Jan 1867: Sporting Gazette Ltd p.67 Issue 222 John Curror listed as a member of the National Coursing Club for Dirleton & N. Berwick, living at Comiston. Fire destroyed 7 wheat stacks in a field at Comiston farm (though it was insured). Colinton mains to be let. Contact Mr Curror, Comiston, Lothian Burn. 26 Sept 1872: The Scotsman. Mr Curror requested compensation from Edinburgh & District Water Works for submerging of a field of potatoes by the bursting of the pipes at the junction of the Swanston and Comiston pipes; accepted £8. 1875 John Curror is “tenant occupier” at Comiston (Valuation Rolls VR108/17/453). Feb 1880: Scotsman classifieds: advert for rent of the farm includes ‘as presently occupied by Mr John Curror’ (his tenancy ended at Martinmas [in November] 1880). 1881 John Curror is resident at Colinton (Census, GROS 677/00001/00011), at Inchdrewer House (now the piping school near Redford Barracks). 11 June 1883: The Times p.1 30843 DEATHS: On the 5th inst., at 35 Manor Place, Edinburgh, Sir John Forrest of Comiston, Bt. Friends will please accept this intimation. [...and on page 12] He was 66. Born 1817. Eldest son of James Forrest, mother Charlotte (nee Horsburgh, of Horsburgh, Peeblesshire). Sir John died unmarried therefore the title passes to his only surviving brother William (former officer in the 79th Foot) born 1823, married 1852 to Margaret Anne Dalziel. 1885 John Curror is “tenant occupier” at Comiston (Valuation Rolls VR108/21/284 & 285). 8 July 1885: John Curror dies at Inchdrewer House, Colinton (Edinburgh Sheriff Court Will [SC70/4/215] and Inventory [SC70/1/245]). 1897: Murder! Edward Tervit Thomson of Comiston Farm was murdered by Jane Thomson at Braid Burn, Greenbank. Jane was tried at the High Court in Edinburgh, found guilty, and sentenced to 3 years penal servitude (remitted less than a year later). [National Registers of Scotland JC26/1897/32.] Searching ScotlandsPeople's indexes yields one male named Edward Tervit Thomson born in 1895... if this is he, he was only 2 years old, and one might conclude that Jane was his mother, though the papers of the case are probably available. Late 1800s: Old photo of John Waldie, Dairyman, with his horse and cart (and dog) standing outside the NW corner of Comiston Farm's garden wall (on Peter Stubbs website www.edinphoto.org.uk, the subject being the grandfather of William Paterson). 25 may 1921: At Comiston House (the Forrest's house, not the farm), Samuel Gilmour, joiner, quotes for dry rot repairs to Miss Elphinston's bedroom and dressing room [City of Edinburgh Archives ACC322]. Article about Edinburgh Gliding Club's first outing on the fields of Comiston Farm. 1953: The circumstances in which CEC acquired Comiston Farmhouse. 1955: CEC acquired Comiston Farmhouse (and all of the Forrest family's land). 1970s: Personal Communication: Farmhouse was boarded up, and children would push past the planks boarding up the windows and play inside. When? : Empty car rolls backwards down Pentland View and damages r.h. gate pier and wall (subsequently repaired). When? : Farmhouse used as a care home. Latest use (from when? to 2015): Farmhouse used as a "Close Support Unit" by City of Edinburgh Council. 5 April 2016: Bidder's architect's presentation at Fairmilehead Community Council meeting. 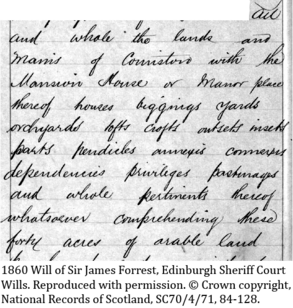 Thursday 26 May 2016: Historic Environment Scotland publish their decision NOT to grant Comiston Farmhouse "Listed" status [Link to documentation about the decision]. However, most generously, they state that "Although the building does not meet the criteria for listing we consider that it would be appropriate at this time to make a photographic record of the building for our public archive. We have therefore asked our Survey and Recording colleagues to undertake a photographic survey of the building in order to record it in its current form." Isn't the part that says "in its current form" just delightful? Do they suppose its "future form" will be worth photographing as well? Why don't they just say "before 150 years of history and a beautiful functional well-maintained historic piece of architecture is obliterated in pursuit of money by City of Edinburgh Council" and have done with it? DEATH SENTENCE Friday 27 May 2016: Planning Application published on City of Edinburgh Council's Planning Portal [Link], "Demolition of existing building, erection of 37 Flats, formation of new site entrance and parking area, landscaping works and all other associated works." Monday 11 July 2016: Period for public comments on the planning application ended. Total public comments: 236 (of which 234 are objections). 9 February 2017: Developer's revised plans published on CEC Planning Portal. "Material change" means a new round of public comments... but only 2 weeks given this time by the Council! Disgraceful, as half-term break means parents many are away on holiday. Suspicious timing, eh? [Later, we discover that 2 different letters had two different deadlines... anyway, it's now 3 weeks (deadline is 3 March)]. 24 March 2017: Site visit to Comiston Farmhouse by members of the Council's Development Management Sub-Committee. 19 April 2017: Planning permission refused at a Hearing at a meeting of the Development Management Sub-Committee. The developer has 3 months in which to appeal. July 2017: Developer lodges appeal against refusal of planning permission. 12 September 2017: Site visit by Government Reporter regarding Appeal. 14 September 2017: Meeting at Edinburgh Council's City Chambers involving residents (Liz Sim and Simon Newton), Councillors (Jason Rust and Scott Arthur), and Council officials Peter Watton (Head of Estates), Elaine Scott & her manager Michael Thain (Housing & Regeneration) to discuss current position and the future. 9 October 2017: Site meeting at CFH between Liz Sim and Simon Newton (residents) and Elaine Scott and Alistair McArthur (respectively Housing Services Manager/Housing and Development, and Senior Project Manager, 21st Century Homes/Housing and Regeneration with Edinburgh Council), the aim being to introduce them to the farmhouse/site, and exchange ideas about a satisfactory solution for the future. March 2018: The Registered Social Landlord to whom the Council offered the site for development of social or affordable housing declines the offer. April 2018: The Council decides the farmhouse will be marketed through an estate agent as a house on the residential property market. Mammals: Foxes (and their cubs) play in the garden. Grey squirrels live there. Birds: Siskins (pair of), probably interested in the cedar trees. Chiff-chaffs return mid-April, the willow warblers by late April. Bullfinches (attracted by buds on cherry trees). Blackcap warblers back by early May. Mistle thrush sings in the limes, alongside goldfinches. Greater-spotted woodpeckers search dead branches for food. Crows nest in the cedar. Treecreepers spiralling up trees searching crevices for morsels. Blog by Councillor Dr Scott Arthur mentioning the Appeal. Blog piece written by Liz Sim for the Ian Murray (MP) website (PDF). "A Plea to Preserve Comiston Old Farmhouse" by Gavin Sprott (PDF). History of Comiston by Carolyn Lincoln (PDF). LOOK WHAT CAN BE DONE 200m away from the Farmhouse... Comiston Stables redeveloped into a home (Juniper Projects). It's listed, but even so, CFH is in perfect condition whereas the Stables were derelict. 1920 Photo from livingmemory.co.uk looking south towards Comiston Farm. Blog by Peter Hoffman, "6OxgangsAvenue", in which local history, including Comiston Farmhouse, is mentioned. Blog by "Scriever" mentioning Robert Louis Stevenson's writings about Edinburgh (and mentioning Comiston). Dictionary of Scottish Architects page indicating that there exist William Notman's (architect's) drawings of Comiston Farmhouse at the RCAHMS/HES (Royal comission on Ancient and Historic Monuments Scotland, now Historic Environment Scotland)... and after much searching they have now found them [29 April 2016]. "Design" date is 26 April 1859. And this link to another DSA page shows that the architect of Comiston House, William Notman, was apprenticed/assistant to the renowned architect William Henry Playfair. Edinburgh City Archives general page. Excellent interactive map of the Local Development Plan. Interactive map showing Tree Preservation Orders (CFH's TPO is No. 187). Edinburgh's "Second Proposed Local Development Plan (14 May 2015)". "Conservation" page, with links onward to: Listed Buildings • Conservation Areas (and character appraisals review) • Biodiversity Conservation • Skyline Study • Landscapes and Scenery • Nature Conservation Sites • World Heritage in Edinburgh. "Planning and Building" page, with links onward to: Planning online services • Building warrants • Conservation • Property enquiry certificates • Strategic Development Plan • Planning applications [Commenting] • Local plans and guidelines • Enforcement • Edinburgh's public spaces • Permissions for development • Planning news. The "Listed Building" decisions for the Spring Heads nearby... HARE, MOUBRAY, FOX, SANDGLASS AND PEEWIT (Historic Environment Scotland). Comiston House at Camus Park - Listed Building entries (x3) on Historic Scotland's website (Stable Block, Doocot, Gate Piers).